10. JOHN7 BYATT (MARY ANN6 CAMP, JOSHUA5, GEORGE4, GEORGE3, DANIEL2, GEORGE1) was born Bef. Mar 1827 in Henham , Essex, and died Sep 1891 in St Ives, Hunts. He married ANN DAY Mar 1851 in St Ives, Hunts. She was born 1828 in Needingworth, Hunts, and died Sep 1878 in St Ives, Hunts. i. EMILY DAY8 BYATT, b. Sep 1851, Swavesey, Cambs; d. Jun 1909, Bethnal Green RD. 60. ii. ELIZA BYATT, b. Jun 1853, Swavesey, Cambs; d. Unknown. 61. iii. WILLIAM BYATT, b. Jun 1858, Swavesey, Cambs; d. Unknown. 62. iv. JOHN BYATT, b. Sep 1861, Swavesey, Cambs; d. Dec 1895, St Ives, Hunts. 63. v. MARY JANE BYATT, b. Apr - Jun 1864, Swavesey, Cambs; d. Unknown. vi. ANN ELIZABETH BYATT, b. Jun 1868, Swavesey, Cambs; d. Jun 1886, St Ives, Hunts. vii. CHARLES THOMAS BYATT, b. Jul 1870, Swavesey, Cambs; d. Unknown; m. ROSE WILSON, Jun 1902, Huntingdon District; b. Unknown; d. Unknown. viii. SARAH ANN BYATT, b. Mar 1874, Swavesey, Cambs; d. Unknown. i. ALICE8 BYATT, b. 1852, St Ives, Hunts; d. Unknown. 64. ii. MARY ANN BYATT, b. 12 May 1854, St Ives, Hunts; d. Mar 1926, Whittlesey, Cambs. iii. CHARLES BYATT, b. Mar 1856, St Ives, Hunts; d. Jun 1858, St Ives, Hunts. iv. DAVID BYATT, b. Mar 1858, St Ives, Hunts; d. 1873, Caxton, Cambs. v. CHARLES BYATT, b. Dec 1860, St Ives, Hunts; d. Dec 1910, Ely District. 65. vi. ARTHUR BYATT, b. Jul - Sep 1868, St Ives, Hunts; d. Unknown. 66. vii. ALBERT MARTIN BYATT, b. Jul - Sep 1871, St Ives, Hunts; d. Unknown. 67. i. WILLIAM 8 MALLYON, b. Jul - Sep 1856, St Ives, Hunts; d. Oct - Dec 1892, Derby RD. 68. i. EDWARD8 BYATT, b. Apr - Jun 1856, St Ives, Hunts; d. Unknown. 69. ii. WILLIAM HENRY SMITH, b. Aug 1860, Stepney, Middx; d. Unknown. iii. ELIZA SMITH, b. 1871, Stepney, Middx; d. Unknown. iv. ELIZABETH SMITH, b. 1871, Stepney, Middx; d. Unknown. v. JOSEPH SMITH, b. 1880, Stratford, Essex; d. Unknown. i. CHARLES HENRY8 BYATT, b. Jun 1867, St Ives, Hunts; d. Unknown; m. ELIZABETH ROBERTS, Dec 1893, Prestwich, Lancs RD; b. 1864, Northamptonshire; d. Unknown. ii. MARY ANN BYATT, b. Mar 1869, St Ives, Hunts; d. Unknown; m. JOHN DAVID PRICE, Jun 1892, Liverpool RD; b. Sep 1870, Bangor, Caernarfonshire; d. Unknown. iii. GEORGE EDWARD BYATT, b. Dec 1870, St Ives, Hunts; d. Jan 1872, St Ives, Hunts. iv. GEORGE RICHARD BYATT, b. Mar 1873, St Ives, Hunts; d. Unknown. v. JAMES BYATT, b. Dec 1875, St Ives, Hunts; d. Unknown. 70. vi. ARTHUR HENRY BYATT, b. Sep 1879, St Ives, Hunts; d. Unknown. vii. ALFRED THOMAS BYATT, b. Apr - May 1883, St Ives, Hunts; d. Unknown; m. AMY PURDON, Jun 1907, West Derby RD; b. 1885; d. Unknown. viii. FRANK BYATT, b. 03 Jan 1886, St Ives, Hunts; d. Sep 1886, St Ives, Hunts. i. EMILY MARY8 BYATT, b. Sep 1882, Stratford, Essex; d. Unknown; m. HERBERT TOWN, Mar 1908, Croydon RD; b. 1880; d. Unknown. ii. ETHEL MAUD BYATT, b. Mar 1885, Stratford, Essex; d. Unknown. iii. CLARA BYATT, b. Dec 1887, Stratford, Essex; d. Unknown. i. SUZANNAH8 FRANKHAM, b. 1852, Broxted, Essex; d. Unknown. ii. SARAH ANN FRANKHAM, b. 1855, Broxted, Essex; d. Unknown. 71. iii. WILLIAM FRANKHAM, b. 1858, Broxted, Essex; d. Unknown. iv. ARTHUR FRANKHAM, b. Nov 1860, Stratford, Essex; d. Unknown. v. ALFRED FRANKHAM, b. 1863, Stratford, Essex; d. Unknown. vi. JAMES FRANKHAM, b. 1865, Stratford, Essex; d. Unknown. vii. JOHN FRANKHAM, b. 1868, Stratford, Essex; d. Unknown. viii. ALICE H. FRANKHAM, b. Sep 1870, Stratford, Essex; d. Unknown. ix. KATE ELIZABETH FRANKHAM, b. 1875, Stratford, Essex; d. Unknown. x. GEORGE H. FRANKHAM, b. 1877, Stratford, Essex; d. Unknown. xi. FREDERICK WILLIAM FRANKHAM, b. Nov 1880, Stratford, Essex; d. Unknown. 72. i. MARTHA8 BENTLEY, b. Jan - Mar 1852, Debden, Essex; d. 1888, Debden, Essex. 73. ii. WILLIAM BENTLEY, b. 1853, Debden, Essex; d. Unknown. iii. FREDERICK BENTLEY, b. Sep 1856, Debden, Essex; d. Unknown; m. SUSAN; b. 1851, Broxted, Essex; d. Bef. 1891. 74. iv. ALFRED BENTLEY, b. Mar 1859, Debden, Essex; d. Unknown. i. HARRIETT8 BENTLEY, b. 1856, Debden, Essex; d. Unknown. ii. CHARLOTTE BENTLEY, b. 1858, Debden, Essex; d. Unknown. 75. iii. ALFRED BENTLEY, b. 1860, Debden, Essex; d. Unknown. 76. iv. ARTHUR BENTLEY, b. Jul - Sep 1862, Debden, Essex; d. 14 Apr 1937, Ealing, London. 77. v. GEORGE BENTLEY, b. 1865, Debden, Essex; d. Unknown. 78. vi. ALBERT BENTLEY, b. 1868, Debden, Essex; d. Unknown. vii. WILLIAM BENTLEY, b. 1869, Debden, Essex; d. Oct - Dec 1871, Debden, Essex. viii. ROSE E. BENTLEY, b. 1874, Debden, Essex; d. Unknown. ix. SIDNEY BENTLEY, b. 1878, Debden, Essex; d. Unknown. i. ELIZABETH8 BENTLEY, b. 1869, Henham, Essex; d. Unknown. 79. ii. ALFRED BENTLEY, b. 1872, Henham, Essex; d. Unknown. iii. HERBERT BENTLEY, b. 1876, Henham, Essex; d. Unknown. 80. iv. FRANK CHARLES BENTLEY, b. 21 Jan 1881, Henham, Essex; d. 25 Mar 1918, France - killed in action. v. ANNIE BENTLEY, b. 1884, Henham, Essex; d. Unknown. vi. ALBERT BENTLEY, b. 1886, Henham, Essex; d. Unknown. i. SUSANNAH8 SAGE, b. Oct - Dec 1862, Henham, Essex; d. Unknown. ii. MAHALA SAGE, b. Mar 1866, Henham, Essex; d. 07 Mar 1918, Camden Town, London. iii. ALBERT ROBERT8 WILLETT, b. 1874, Henham, Essex; d. Unknown. 81. iv. ZIBA WILLETT, b. 1876, Henham, Essex; d. Unknown. v. ALFRED WILLETT, b. Feb 1881, Henham, Essex; d. Unknown. i. ALFRED8 NEVILLE, b. 1864, Henham, Essex; d. Unknown. ii. SUSAN BENTLEY, b. 1866, Henham, Essex; d. Unknown. iii. MARGARET BENTLEY, b. 1869, Henham, Essex; d. Unknown. iv. FREDERICK BENTLEY, b. Jan 1871, Henham, Essex; d. Unknown. 82. v. WILLIAM J. BENTLEY, b. 1873, Henham, Essex; d. Unknown. vi. MARTHA BENTLEY, b. 1878, Henham, Essex; d. Unknown. 83. vii. MARY ANN BENTLEY, b. 11 Aug 1881, Henham, Essex; d. 11 Apr 1966, Henham, Essex. i. ROSE BENTLEY, b. 1870, Debden, Essex; d. Unknown. ii. ALICE BENTLEY, b. 1873, Debden, Essex; d. Unknown. iii. FRANK BENTLEY, b. 1876, Debden, Essex; d. Unknown. iv. ALFRED BENTLEY, b. 1878, Debden, Essex; d. Unknown. v. HARRY BENTLEY, b. 1882, Debden, Essex; d. Unknown. vi. ANNIE BENTLEY, b. 1885, Debden, Essex; d. Unknown. vii. JAMES BENTLEY, b. 1887, Debden, Essex; d. Unknown. viii. ELIZABETH BENTLEY, b. 1890, Debden, Essex; d. Unknown. 23. ANN7 CAMP (PETER6, JOSHUA5, GEORGE4, GEORGE3, DANIEL2, GEORGE1) was born 08 Mar 1833 in Debden, Essex, and died Oct - Dec 1862 in Debden, Essex. She married GEORGE CAMP in See Notes, son of JOSHUA CAMP and MARY FROST. 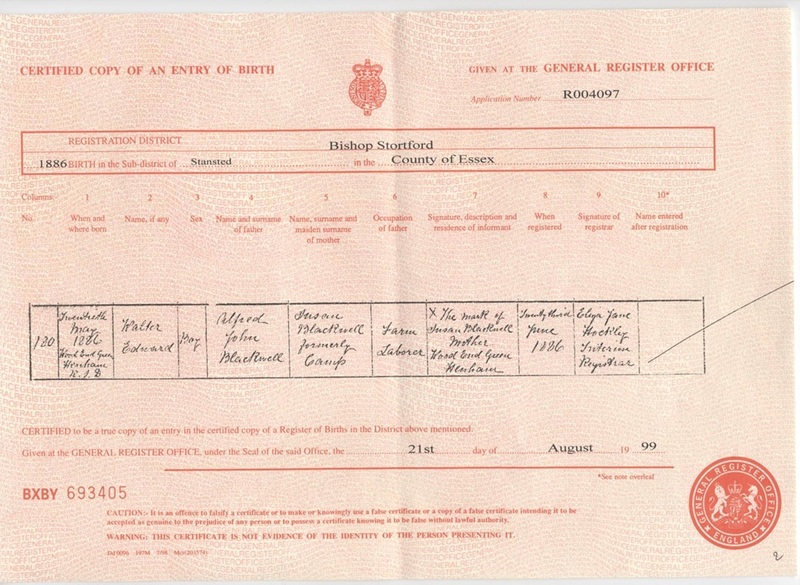 He was born 1827 in Chickney, Essex, and died 28 Mar 1911 in Handpost Cottage, Debden, Essex. More About ANN CAMP: Baptism: 07 Apr 1833, Debden Parish Church Burial: 20 Dec 1862, Debden, Essex aged 30 Census: 1841, Aged 8 yrs and living with parents at Burnt House Chickney More About GEORGE CAMP: Address (Facts Pg): 1851 - 1911, Hand Post, Amberden End, Debden Burial: 01 Apr 1911, Henham Parish Church (Aged 83) Census: 1841, Aged 14 yrs and living with parents at Amberden End Occupation: 1851 - 1891, Ag. lab. Children are listed above under (9) George Camp. 24. JOHN7 CAMP (PETER6, JOSHUA5, GEORGE4, GEORGE3, DANIEL2, GEORGE1) was born 05 Jun 1837 in Chickney, Essex, and died Unknown. He married MARY SKINGLE Oct - Dec 1868 in Chickney, Essex. She was born 1840 in Bandon, Co Cork, Ireland, and died Unknown. More About JOHN CAMP: Address (Facts Pg): 1901, 4 Hill Street, Bolton, Lancs Census: 1841, Aged 4 yrs and living with parents at Burnt House, Chickney Occupation: 1901, Labourer Iron Foundry More About MARY SKINGLE: Address (Facts Pg): 1901, 4 Hill Street, Bolton, Lancs Census: 1901, Aged 60 living with husband John and three children. i. WILLIAM 8 CAMP, b. 1874, B Sub., Gibraltar; d. Unknown. ii. JOSEPH AMBROSE CAMP, b. Jul - Sep 1880, Bishops Stortford, Herts; d. Unknown. Census: 1901, Aged 21, living with parents, brother William and sister Georgina. iii. GEORGINA CAMP, b. 1883, Bandon, Co Cork, Ireland; d. Unknown. i. JESSE PERCY8 CAMP, b. 28 Sep 1873, Chickney, Essex; d. Jul - Sep 1886, Henham, Essex. ii. KATE EMMA CAMP, b. 03 Apr 1875, Chickney, Essex; d. Unknown; m. ARTHUR J. PRICE; b. 1874, Gower Street, London; d. Unknown. Census: 1901, Aged 27, living at 18 Green Lane, Stoke Newington with wife Kate E.
iii. EPHRIAM GEORGE CAMP, b. 11 Feb 1877, Chickney, Essex; d. 23 Feb 1969, 114 Dale Road, Newham, London; m. SARAH ANN SPELLER, Sep 1899, West Ham RD; b. Jul - Sep 1879, Henham, Essex; d. Unknown. 84. iv. ROSE ANNIE CAMP, b. 31 Oct 1878, Chickney, Essex; d. Unknown. 85. v. SYDNEY ARCHIBALD CAMP, b. 16 May 1880, Chickney, Essex; d. Unknown. 86. vi. ZIBA ALFRED CAMP, b. 29 Mar 1882, Henham, Essex; d. 20 Nov 1946, Whipps Cross Hospital. 87. vii. FREDERICK CAMP, b. 06 Apr 1884, Henham, Essex; d. Unknown. 88. viii. FRANK CAMP, b. 01 Oct 1886, Henham, Essex; d. Unknown. 89. ix. MABEL B. CAMP, b. 1889, Henham, Essex; d. Unknown. i. ELIZABETH8 CAMP, b. 1867, Great Dunmow, Essex; d. Unknown. i. THOMAS8 PARKER, b. Jan 1891, Lambeth, London; d. Unknown. i. EDITH E.8 SMITH, b. 1873, Thaxted, Essex; d. Unknown. 90. ii. HILDA ALICE SMITH, b. Sep 1879, Plaistow, Essex; d. Unknown. iii. WALTER CHARLES L. SMITH, b. 10 Feb 1881, Plaistow, Essex; d. Unknown; m. GRACE ALICE ALLMAN, 11 Sep 1904, Poplar, Middx; b. Oct - Dec 1878, St George In The East, London; d. Unknown. iv. CHARLES SMITH, b. 1882, Canning Town; d. Unknown. v. WILLIAM GEORGE H. SMITH, b. Mar 1883, Canning Town; d. Unknown. vi. ERNEST EDGAR S. SMITH, b. 1889, Canning Town; d. Unknown. i. ISAAC8 CAMP, b. 1879, Grassmoor, Derbys; d. Unknown. ii. MATILDA CAMP, b. Dec 1880, Grassmoor, Derbys; d. Unknown. iii. ANNIE E CAMP, b. 1888, Grassmoor, Derbys; d. Unknown. iv. GEORGE E. CAMP, b. 1890, North Wingfield, Derbys; d. Unknown. v. ALFRED W. CAMP, b. 1893, Dronfield, Derbys; d. Unknown. vi. PHYLLIS M. CAMP, b. 1900, Bolsover, Derbys; d. Unknown. i. GEORGE CAMP8 HARRISON, b. 1886, Grassmoor, Hasland, Derby; d. Unknown, Motorcycle Accident; m. ELIZABETH DOWNS; b. 1890; d. Unknown. ii. FLORENCE HARRISON, b. 1888, Grassmoor, Hasland, Derby; d. Unknown; m. ? SAVAGE; b. Unknown; d. Unknown. 91. iii. JOHN WILLIAM HARRISON, b. 06 Feb 1890, Grassmoor, Hasland, Derby; d. Unknown. 92. iv. ERNEST HARRISON, b. 23 Jun 1892, Grassmoor, Hasland, Derby; d. Unknown. 93. v. DAISY HARRISON, b. 1893, Langwith, Notts; d. Unknown. vi. MINNIE HARRISON, b. 1896, Langwith, Notts; d. Unknown, Skegness, Lincs; m. (1) JOHN PAYNE; b. 1895; d. Unknown; m. (2) EADON POWELL, 1921 - 1929; b. 1895; d. Unknown, Committed Suicide. 94. vii. HILDA A. HARRISON, b. 1899, Langwith, Notts; d. Unknown. 95. viii. WILFRED HARRISON, b. 1901, Langwith, Notts; d. 21 Feb 1982, Hargeaves Avenue, Laughton. 96. i. CHARLES8 DAWES, b. 1885, Chesterfield, Derbys; d. 07 Nov 1916, France - WW1. ii. GEORGE DAWES, b. 1886, Chesterfield, Derbys; d. 07 Aug 1915, Galipoli - WW1. 97. iii. FLORENCE DAWES, b. 1888, Glebeland, NSW, Australia; d. 25 Nov 1952, Korumburra, Victoria, Australia. iv. WILLIAM DAWES, b. 1890, Mereweather, NSW, Australia; d. 1969, Victoria, Australia; m. FLORENCE BEATRICE LEIGHTON, 1914; b. 1890; d. Unknown. v. ISABELLA MAUD DAWES, b. 1892, Mereweather, NSW, Australia; d. 23 Dec 1972, Korumburra, Victoria, Australia; m. JAMES WILLIAM BLACKWELL, 1911; b. 1890; d. 1950.
vi. EVA DAWES, b. 1895, Adamstown, NSW, Australia; d. Nov 1979, Melbourne, Australia; m. FRANK BENSON HASTINGS, 1920; b. 1895; d. 1960.
vii. RICHARD GORDON DAWES, b. 1899, Victoria, Australia; d. 08 Nov 1916, France - WW1. 98. viii. IDA BEATRICE DAWES, b. 1900, Korumburra, Victoria, Australia; d. 20 Sep 1963, Melbourne, Australia. ix. OLIVE BERYL HANNAH DAWES, b. 1903, Korumburra, Victoria, Australia; d. Sep 1953, Melbourne, Australia; m. FRANK RALPH, 1925; b. 1900; d. Nov 1976.
i. FREDERICK8 SMITH, b. 1867, Thaxted, Essex; d. Unknown; m. ALICE; b. 1875, Ireland; d. Unknown. ii. LYDIA ANN SMITH, b. 1869, Thaxted, Essex; d. Unknown. iii. CHARLES SMITH, b. 1874, Church Greasley, Derby; d. Unknown. 99. iv. ENOCH SMITH, b. 1879, Bagworth, Leics; d. Unknown. v. GEORGE SMITH, b. Nov 1880, Bagworth, Leics; d. Unknown. 100. i. ARTHUR WILLIAM 8 CAMP, b. Dec 1870, Chickney, Essex; d. Unknown. ii. CHARLES HENRY CAMP, b. Oct - Dec 1872, Chickney, Essex; d. Unknown. 101. iii. SARAH ANN CAMP, b. Mar - Jun 1875, Chickney, Essex; d. Unknown. iv. HARRIET E. CAMP, b. 1879, Chickney, Essex; d. Unknown. 102. v. ALICE CAMP, b. Oct - Dec 1884, Chickney, Essex; d. Unknown. vi. JANE CAMP, b. Oct - Dec 1884, Chickney, Essex; d. Unknown; m. ? FROST; b. Unknown; d. Unknown. 103. vii. KATE ELIZABETH CAMP, b. 16 Jun 1888, Spring Gate, Chickney, Essex; d. Aft. 1948, Henham , Essex (approx 60- 63 yrs). viii. KATE CAMP, b. 1899, Chickney, Essex; d. 1899, Debden Green, Essex. 104. i. JOHN 8 CAMP, b. 1868, Chickney, Essex; d. Unknown. i. BLANCHE ELIZABETH8 CAMP, b. Sep 1873, Henham, Essex; d. Unknown; m. WALTER MUNCEY, Oct - Dec 1895, Bishops Stortford District; b. 1862, Stetchworth, Cambs; d. Unknown. 105. ii. ABEL WILLIAM CAMP, b. Mar 1875, Henham , Essex; d. Unknown; Stepchild. 106. iii. CHARLES HENRY CAMP, b. Mar 1877, Henham , Essex; d. 1929; Stepchild. iv. EMMA ELIZA CAMP, b. Jun 1879, Henham , Essex; d. Unknown; Stepchild. v. EDWARD GEORGE CAMP, b. Mar 1883, Henham , Essex; d. Unknown; Stepchild. vi. ALICE HARRIET D. CAMP, b. Sep 1889, Henham , Essex; d. Unknown; Stepchild. vii. FLORENCE MINNIE CAMP, b. Jun 1892, Henham, Essex; d. Unknown; Stepchild. viii. ALBERT WALTER CAMP, b. Mar 1897, Henham, Essex; d. 09 May 1956, Henham, Essex; Stepchild; m. LILY ELIZABETH NEVILLE; b. Jan - Mar 1889, Henham, Essex; d. 10 Feb 1986, Henham, Essex. i. THOMAS E8 CAMP, b. Apr - Jun 1873, Chickney, Essex; d. Unknown. ii. WALTER CAMP, b. 1876, Leyton, Essex; d. Unknown. iii. ELIZABETH T. CAMP, b. 1878, Poplar, Middx; d. Unknown. iv. AMOS JAMES W. CAMP, b. Apr - Jun 1880, Poplar, Middx; d. Unknown. i. WILLIAM 8 CAMP, b. 1879, Tottenham, Middx; d. Unknown. ii. ALFRED ERNEST CAMP, b. 1881, Henham, Essex; d. Unknown. iii. JOSEPH F CAMP, b. 1885, Tottenham, Middx; d. Unknown. iv. ARTHUR THOMAS CAMP, b. Jun 1890, Edmonton, Middx; d. Unknown. v. LEONARD M CAMP, b. 1893, Edmonton, Middx; d. Unknown. vi. JOHN A CAMP, b. 1898, Edmonton, Middx; d. Unknown. vii. FRANK C CAMP, b. Jan 1901, Edmonton, Middx; d. Unknown. i. THOMAS WILLIAM 8 CAMP, b. Oct - Dec 1887, Henham, Essex; d. 29 Mar 1967, Henham, Essex; m. ADA; b. 1890; d. Unknown. 107. ii. FREDERICK CHARLES CAMP, b. 06 Dec 1889, Burnt House, Chickney, Essex; d. 27 Aug 1936, Henham, Essex. iii. FRANK PERCY CAMP, b. 13 Dec 1891, Burnt House, Chickney, Essex; d. 01 Jul 1916, Somme, France. 108. iv. ALICE MAUD CAMP, b. 21 Nov 1895, Chickney, Essex; d. 07 Nov 1969.
v. FLORENCE ESTHER CAMP, b. Jan - Mar 1898, Chickney, Essex; d. Unknown; m. ? WHITE; b. Unknown; d. Unknown. vi. EDITH EMILY CAMP, b. Jun 1900, Henham , Essex; d. Unknown; m. CLIFFORD GEORGE WARNER, 16 Apr 1927, Henham Parish Church; b. 1899, Henham, Essex; d. 11 Aug 1961, Henham, Essex. Census: 1901, Aged 11 months and living with parents at Church Street, Henham. 109. i. FREDERICK W.8 DENNISON, b. 1885, Chickney, Essex; d. Unknown. ii. ALICE ELIZABETH DENNISON, b. 1887, Chickney, Essex; d. Unknown. iii. WALTER THOMAS DENNISON, b. 1889, Chickney, Essex; d. Unknown. 110. iv. KATE E. DENNISON, b. Jan 1891, Henham, Essex; d. 20 Apr 1964, Henham, Essex. v. GEORGE A DENNISON, b. 1897, Henham, Essex; d. Unknown. vi. ARTHUR J. DENNISON, b. 1898, Henham, Essex; d. Unknown. i. JULIA8 CAMP, b. Oct - Dec 1865, Thaxted, Essex; d. Oct - Dec 1873, Blything District. ii. CHARLES CAMP, b. 1869, Thaxted, Essex; d. 1942. 111. iii. GEORGE ALFRED CAMP, b. 22 Nov 1870, Cutlers Green, Thaxted, Essex; d. 05 Dec 1966, Patrick Stead Hospital, Halesworth, Suffolk. iv. SARAH ANN CAMP, b. Jul - Sep 1873, Hinton, Suffolk; d. 1899, Ilketshall, Suffolk. v. HENRY CAMP, b. 1876, Hinton, Suffolk; d. 1954; m. BERTHA ANN HARDWICK, Dec 1901, Chesterfield RD; b. 1880; d. Unknown. vi. ANNIE CAMP, b. 1882, Hinton, Suffolk; d. 1910. 112. vii. ELLEN CAMP, b. 04 Jul 1887, Ilketshall St Lawrence, Suffolk; d. Dec 1975, 5 School View Bungalows, Ilketshall St. Lawrence, Suffolk. i. WILLIAM 8 BARLTROP, b. Oct - Dec 1865, Old Sampford, Essex; d. Unknown. ii. HARRY BARLTROP, b. 1868, Great Dunmow, Essex; d. Unknown. iii. MARY ANN BARLTROP, b. 1870, Great Dunmow, Essex; d. Unknown. 113. iv. FRED ALFRED BARLTROP, b. Jul - Sep 1871, Great Dunmow, Essex; d. Unknown. v. ERNEST GEORGE BARLTROP, b. Oct - Dec 1873, Great Dunmow, Essex; d. Unknown. vi. HERBERT EDWARD BARLTROP, b. Jan - Mar 1876, Great Dunmow, Essex; d. Unknown. vii. ALEXANDER WALTER BARLTROP, b. May 1880, Great Easton, Essex; d. Unknown. viii. HUGH LEONARD BARLTROP, b. Jul - Sep 1882, Great Easton, Essex; d. Unknown. ix. FRANK BARLTROP, b. 1886, Great Easton, Essex; d. Unknown. 114. i. FREDERICK A.8 GRAVES, b. 1867, Debden, Essex; d. Unknown. ii. SARAH A. GRAVES, b. 1872, Debden Essex; d. Unknown. iii. GEORGE WILLIAM GRAVES, b. 1873, Debden, Essex; d. Unknown; m. CLARA SAVILLE; b. 1876, Thaxted, Essex; d. Unknown. iv. AGNES GRAVES, b. 1876, Debden Essex; d. Unknown. v. KATE ALICE GRAVES, b. Apr - Jun 1879, Debden Essex; d. Unknown. vi. WALTER GRAVES, b. 1884, Debden, Essex; d. Unknown. i. MINNIE ANN8 CAMP, b. Jan - Mar 1875, Thaxted, Essex; d. Unknown. ii. HENRY CAMP, b. Oct - Dec 1878, Thaxted, Essex; d. Apr - Jun 1900, Dunmow District. i. ROSINA8 JARVIS, b. 19 Jan 1873, Thaxted, Essex; d. Unknown. 115. i. ELLEN CHRISTINA8 CAMP, b. Sep 1875, Rook End, Debden,Essex; d. Unknown. ii. JANE CAMP, b. 05 Jul 1878, Rook End, Debden, Essex; d. 05 Jul 1878, Debden, Essex. 116. iii. LINDSEY ALBERT CAMP, b. 09 Jul 1879, Rook End, Debden, Essex; d. 1970 - 1979.
iv. JAMES CAMP, b. 1881, Rook End, Debden, Essex; d. Unknown. 117. v. FREDERICK GEORGE CAMP, b. 24 Jun 1882, Rook End, Debden, Essex; d. 14 Nov 1940, Bishops Stortford, Herts. vi. SARAH BERTHA CAMP, b. 18 Jan 1885, Rook End, Debden, Essex; d. 1985; m. ROBERT BRUNT, Apr - Jun 1910, Saffron Walden District; b. Unknown; d. Unknown. vii. ROSE BEATRICE CAMP, b. 17 May 1887, The Homestead, Wicken Road, Newport, Essex; d. Apr - Jun 1888, Saffron Walden District. viii. EDITH KATE CAMP, b. Jul - Sep 1889, Rook End, Debden, Essex; d. Unknown; m. EDWARD GRAHAM; b. 1890; d. Unknown. ix. WILLIAM ARTHUR CAMP, b. 17 Jun 1890, Rook End, Debden, Essex; d. 13 May 1917, Ypres, in action during 1st World War. See Military Scroll; m. FREDA DAPHNE; b. Unknown; d. 30 Jun 1967.
x. LAURA EVELINE CAMP, b. Jan - Mar 1893, The Homestead, Newport, Essex; d. 1945.
xi. CHARLES HENRY CAMP, b. Apr - Jun 1895, The Homesteads, Horse Keepers Cottage, Wicken Road, Newport, Essex; d. 1959; m. DOROTHY A. SEARLE; b. 1898, Newport, Essex; d. Unknown. 118. xii. SIDNEY JAMES CAMP, b. Jul - Sep 1898, The Homestead, Wicken Road, Newport, Essex; d. 1974, Newport, Essex. xiii. EMILY CAMP, b. Aft. Apr 1881, The Homestead, Wicken Road, Newport, Essex; d. Unknown; m. ? GREY; b. Unknown; d. Unknown. i. JANE8 CAMP, b. 26 Jun 1883, Debden, Essex; d. Unknown; m. ARTHUR JAMES PARKER, 18 Apr 1908, Debden Parish Church; b. 1880, Debden, Essex; d. Unknown. ii. FRANK CAMP, b. 25 Mar 1884, Debden Green, Essex; d. Unknown. iii. JESSE CAMP, b. 31 Oct 1886, Debden, Essex; d. Unknown. iv. JAMES CAMP, b. 08 Jul 1889, Debden, Essex; d. Unknown. v. AGNES CAMP, b. 06 Dec 1893, Debden Green, Essex; d. Unknown; m. DAVID GREY, 01 Mar 1913, Debden Parish Church; b. 1893, Thaxted, Essex; d. Unknown. vi. HERBERT CAMP, b. 09 Sep 1895, Debden Green, Essex; d. Jan - Mar 1897, Debden Green, Essex. vii. ALFRED EDWARD CAMP, b. 31 Mar 1901, Debden Green, Essex; d. Unknown; m. GLADYS KATE CLARK, 09 Aug 1924, Thaxted, Essex; b. 13 Jun 1901, Halstead RD; d. Jan 1984, Enfield RD. Census: 1901, Shown as unnamed infant, under 1 month. Living with parents, brothers Jesse 14, James 11 and sister Agnes 8.
i. MARTHA MARY8 CAMP, b. 01 Dec 1884, Debden, Essex; d. Unknown. ii. AGNES BERTHA CAMP, b. 30 Mar 1887, Debden, Essex; d. Unknown; m. ?, Jul - Sep 1908, Bishops Stortford District. iii. LILY ROSE CAMP, b. 26 Nov 1889, Debden, Essex; d. Unknown. iv. ALBERT WILLIAM CAMP, b. 20 Mar 1892, Debden, Essex; d. Unknown. v. ANNIE MAUD CAMP, b. Jan - Mar 1894, Henham, Essex; d. Unknown. vi. ETHEL WINIFRED CAMP, b. 10 May 1897, Widdington, Essex; d. Unknown. vii. KATE CAMP, b. 1900, Widdington, Essex; d. Unknown. 119. i. HARRY8 WRIGHT, b. Jul - Sep 1878, Widdington, Essex; d. 18 Sep 1907, Parndon, Essex. ii. ALICE WRIGHT, b. 07 May 1880, Widdington, Essex; d. 20 Jan 1981, Parndon, Essex; m. (1) FREDERICK EMBERSON; b. 1880; d. Jun 1960; m. (2) ARTHUR SPRINGHAM, Sep 1902, Bishops Stortford RD; b. Jul - Sep 1878, Bishops Stortford RD; d. 04 Nov 1917, First World War. 120. iii. LUCY WRIGHT, b. 1883, Great Parndon, Essex; d. Unknown. iv. GEORGE WILLIAM WRIGHT, b. Jan - Mar 1884, Netteswell, Essex; d. Unknown; m. WINIFRED; b. Unknown; d. Unknown. 121. v. ROSE JANE WRIGHT, b. Apr - Jun 1887, Great Parndon, Essex; d. 26 Jun 1977, Parndon, Essex. 122. vi. ELLEN WRIGHT, b. 06 Feb 1890, Great Parndon, Essex; d. 21 Jul 1982, Maidstone, Kent. 123. vii. KATHLEEN A. WRIGHT, b. 17 Mar 1892, Great Parndon, Essex; d. 06 Apr 1989, Great Parndon, Essex. viii. ADA WRIGHT, b. 17 Mar 1892, Parndon, Essex; d. 15 Nov 1997, Parndon, Essex. 124. i. FLORENCE ELIZABETH8 CAMP, b. 04 Oct 1883, Debden, Essex; d. 08 Dec 1948.
ii. ABRAHAM CAMP, b. 15 Dec 1884, Debden, Essex; d. Unknown; m. ANNIE BRAY, Jan - Mar 1922, Much Hadham, Herts; b. Unknown; d. Unknown. iii. ALICE JULIA CAMP, b. Apr - Jun 1886, Thaxted, Essex; d. Oct - Dec 1959, Bishops Stortford District; m. JOHN TINSLEY, Oct - Dec 1906, Much Hadham, Herts; b. Apr - Jun 1878, Much Hadham, Herts; d. Jan - Mar 1955, Bishops Stortford District. 125. iv. LILY ROSE MATILDA CAMP, b. 08 Jan 1888, Debden Green, Essex; d. Unknown. v. ARTHUR SMITH CAMP, b. 01 Jan 1890, Debden, Essex; d. Jan - Mar 1972, Surrey; m. ANNIE REBECCA AMBROSE, Jul - Sep 1930, Bury St Edmunds District; b. 1888, Sudbury, Suffolk; d. Unknown. vi. SIDNEY CHARLES CAMP, b. Feb 1891, Debden, Essex; d. Jan - Mar 1972, Ware District; m. LILIAN ROSE STRACEY, 08 Nov 1930, Bishops Stortford District; b. 08 Jul 1912; d. 14 Feb 1979.
vii. ELIZABETH CAMP, b. Jan - Mar 1893, Debden, Essex; d. Jan - Mar 1987, Shrewsbury District; m. LEONARD T. WARREN, Apr - Jun 1937, Bishops Stortford District; b. 1884, Hunsdon, Herts; d. Apr - Jun 1949, Bishops Stortford District. viii. HARRY CAMP, b. 14 Jun 1894, Debden, Essex; d. Apr - Jun 1946, Much Hadham, Herts. ix. EDWARD CAMP, b. 17 May 1897, Debden, Essex; d. 10 Oct 1917, Flanders, Belgium. 126. x. DAISY RACHEL CAMP, b. Jan 1901, Much Hadham, Herts; d. Unknown. 127. xi. FREDERICK GEORGE WILLIAM CAMP, b. 28 Dec 1903, Much Hadham, Herts; d. 21 Oct 1978, Salisbury, Wilts. i. ALFRED8 FIELD, b. Oct - Dec 1873, Chobham, Surrey; d. Unknown. 128. ii. ROBERT FIELD, b. 21 Sep 1875, Chobham, Surrey; d. Jan - Mar 1953, Croydon RD. iii. JANE FIELD, b. Jan - Mar 1877, Chobham, Surrey; d. Unknown. iv. WILLIAM FIELD, b. Jan - Mar 1878, Chobham, Surrey; d. Unknown. v. FRANCES MARGARET FIELD, b. Apr - Jun 1880, Chobham, Surrey; d. Apr - Jun 1881, Chobham, Surrey. vi. JOSEPH FIELD, b. Jan - Mar 1883, Pimlico, Middx; d. Unknown. 129. i. EDITH8 BLACKWELL, b. 1876, Saffron Walden, Essex; d. Unknown. ii. ALFRED GEORGE BLACKWELL, b. 1880, Henham , Essex; d. Unknown; m. FLORENCE HARRIS, Jul - Sep 1900, Bishops Stortford, Herts; b. 1880, Ugley, Essex; d. Unknown. Census: 1901, Living with husband Alfred at 44 Elm Road, Leyton with George & Grace Shilshin, their three children and Walter Harris, a visitor. iii. ELIZABETH BLACKWELL, b. 1884, Henham, Essex; d. Unknown. 131. i. JOSEPH HENRY8 TURNER, b. 05 Feb 1880, Bishops Stortford, Herts; d. Unknown. ii. EDWARD WILLIAM TURNER, b. 22 Dec 1881, Bishops Stortford, Herts; d. Unknown. iii. WILLIAM TURNER, b. 1883, Pimlico, Middx; d. Unknown. iv. DAISY TURNER, b. 1885, Pimlico, Middx; d. Unknown. v. THOMAS B. TURNER, b. 1887, Barking, Essex; d. Unknown. vi. PERCY TURNER, b. 1890, Plaistow, Essex; d. Unknown. vii. FLORENCE TURNER, b. 1893, Plaistow, Essex; d. Unknown. viii. NELLIE TURNER, b. 1895, Plaistow, Essex; d. Unknown. ix. BEATRICE TURNER, b. 1896, Plaistow, Essex; d. Unknown. 132. i. AGNES8 CAMP, b. Jan - Mar 1879, Debden, Essex; d. Unknown. ii. EMILY E.8 BLACKWELL, b. Mar 1881, Debden, Essex; d. Bef. 1891.
iii. ARTHUR W. BLACKWELL, b. 1883, Henham, Essex; d. Unknown. iv. KATE EMMA BLACKWELL, b. Sep - Dec 1885, Henham, Essex; d. Unknown. v. FREDERICK GEORGE BLACKWELL, b. Jan - Mar 1889, Henham, Essex; d. Bef. 1901.
vi. ALICE SARAH BLACKWELL, b. Oct - Dec 1891, Henham, Essex; d. Unknown. vii. GEORGE EDWARD BLACKWELL, b. Jan - Mar 1894, Henham, Essex; d. Unknown. viii. HENRY C. BLACKWELL, b. 1897, Henham, Essex; d. Unknown. i. DAISY E.8 SNOW, b. 1885, Henham, Essex; d. Unknown. ii. KATE A. SNOW, b. Oct - Dec 1886, Henham, Essex; d. Unknown. iii. ELLEN SNOW, b. Mar 1890, Henham, Essex; d. Unknown. iv. STANLEY WALTER SNOW, b. Oct - Dec 1892, Henham, Essex; d. Unknown. v. WINIFRED MAUD SNOW, b. Jan - Mar 1895, Henham, Essex; d. Unknown. vi. LEONARD CHARLES SNOW, b. Apr - Jun 1898, Henham, Essex; d. Unknown. vii. ERNEST WILLIAM SNOW, b. Jul - Sep 1899, Henham, Essex; d. Unknown. i. EMILY ELIZABETH8 DIXON, b. 1888, Debden; d. Unknown. ii. EDWARD GEORGE DIXON, b. May 1890, Debden, Essex; d. Unknown. iii. ADA DIXON, b. 1893, Debden, Essex; d. Unknown. iv. ROSE DIXON, b. 1894, Debden, Essex; d. Unknown. v. FLORENCE DIXON, b. 1896, Henham, Essex; d. 04 Jul 1956, Henham, Essex. vi. FRED DIXON, b. 1896, Henham; d. Unknown. vii. JOSEPH WILLIAM DIXON, b. Mar 1899, Henham, Essex; d. 04 Sep 1918, Somme, World War 1.
viii. ALICE DIXON, b. Dec 1900, Henham; d. Unknown. i. CYRIL WALTER G.8 CAMP, b. Oct - Dec 1895, Plaistow, Essex; d. Unknown. ii. EMILY MATILDA A. CAMP, b. Jul - Sep 1897, Plaistow, Essex; d. Unknown. iii. IRENE ISABEL CAMP, b. Jan - Mar 1899, Plaistow, Essex; d. Unknown. iv. ELSIE VICTORIA V. CAMP, b. Aug 1900, Plaistow, Essex; d. Unknown. 133. i. ALBERT ERNEST8 CAMP, b. 19 Apr 1903, Burnt House, Chickney, Essex; d. 27 Dec 1962, 18 Mill Road, Henham. ii. CELIA EMILY CAMP, b. 10 Jul 1905, Burnt House, Chickney, Essex; d. 06 May 1908, In a Fire at Henham, Essex, aged 2.
iii. CHARLES WALTER CAMP, b. 19 Aug 1907, Henham, Essex; d. 03 Jun 1912, Drowned in a pond at Henham, Essex, aged 4. 134. iv. CLARA ELLEN CAMP, b. 14 Sep 1909, Henham, Essex; d. Unknown. 135. v. GEORGE WILLIAM CAMP, b. 14 Sep 1909, Henham, Essex; d. 15 Jun 1978, Old Mead Cottages, Henham. 136. vi. KATE AGNES CAMP, b. 03 Oct 1913, Henham, Essex; d. 20 Jun 2002, Lister Hospital, Stevenage. i. REGINALD8 BRUCE, b. 1899, Bow, Middx; d. Unknown. ii. HAROLD BRUCE, b. Sep 1900, Bow, Middx; d. Unknown. i. FREDERICK WILLIAM 8 CAMP, b. 12 Jun 1904, Lovecotts Farm, Debden, Essex; d. 27 Feb 1944.
ii. DORIS MAUD CAMP, b. 1905, Lovecotts Farm, Debden, Essex; d. Unknown; m. GEORGE EDWARD GRIFFIN, 02 Nov 1932, Debden Parish Church; b. 1905, Debden, Essex; d. Unknown. 138. iii. FRANK GEORGE CAMP, b. 25 Nov 1905, Lovecotts Farm, Debden, Essex; d. 06 Jun 1982.
iv. ETHEL FLORENCE CAMP, b. 21 Jan 1907, Lovecotts Farm, Debden, Essex; d. Unknown; m. RICHARD HOWARD, 25 Jun 1938, Debden Parish Church; b. 1901; d. Unknown. 139. v. RICHARD JOHN CAMP, b. Jul - Sep 1909, Debden, Essex; d. 20 Jul 1989, Harlow RD.